Bill Clinton and George Bush, Sr.
Former U.S. Presidents Bill Clinton and George Bush, Sr., have completed their three-day, four-country tour of the tsunami region. They visited Thailand, Indonesia, Sri Lanka, and the Maldives. 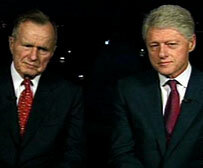 Current President George W. Bush asked the former presidents to lead the U.S. effort to raise private funds for tsunami relief. As for the funds that have been used thus far, both men indicated that tsunami aid is being used effectively. When Clinton was asked if he believed that tsunami aid is being used properly, he replied, “By and large I do.” He also said that non-governmental organizations were doing a good job. However, Clinton emphasized that several more years of relief and rebuilding efforts is necessary. "We have to be prepared to stay at this for three to five years," he said.